The rapper is speaking out against family separations at the U.S.-Mexico border. The Trump Administration's grotesque family separation policy was reversed by the President yesterday. 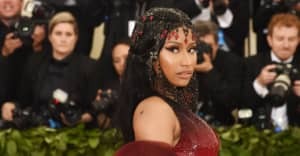 Before the executive order was signed, Nicki Minaj shared a revealing Instagram post describing her own journey in America: "I came to this country as an illegal immigrant @ 5 years old," she wrote. "I can't imagine the horror of being in a strange place & having my parents stripped away from me at the age of 5." Nicki Minaj was born Onika Tanya Maraj in Saint James, Trinidad & Tobago. She continued: "Can you imagine the terror & panic these kids feel right now? Not knowing if their parents are dead or alive, if they'll ever see them again..."
The fight against cruel incarceration of immigrants is far from over. While it appears that parents who illegally enter the country will no longer have their children taken from them, there does not appear to be any government plan for reuniting the thousands who have already been displaced. In fact, families may be detained together indefinitely, Amnesty International claimed in a press release.